Wasn't the weather glorious on Sunday? - A perfect English summer day, even though it was only May, and technically still spring. In the UK we obsess about the weather, and my theory is that all those miserable grey days make us really appreciate how staggeringly beautiful our countryside is when the sun finally manages to put in an appearance. My Spanish family joke about how, after only five minutes of sunshine, half of London will have grabbed their deck chairs, donned their bathers and made it down to the park to soak up the rays. It's all right for them with their 360 days of blue skies and sunshine every year, but we have to make the most of it when the sun breaks through! We seized the moment and went for a long walk along the river with our very good friends who'd got rained off the weekend before. The sun beat down, we caught up with one another's news, our children skipped along in front telling their own tall tales and the rowing eights sped past on the water. 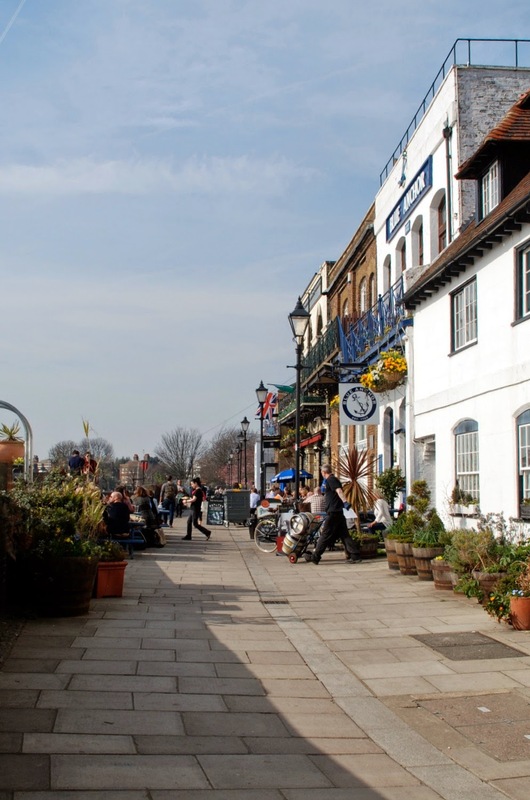 Our walk followed the route of my Boat Race/ Chiswick Tow Path Walk, which you can find here: Boat Race Walk. Everyone and their dog was out enjoying the rays, and I don't think I've ever seen so little water in the river. It was a super-low tide. In fact it would have been possible to walk across the empty channel to Chiswick Eyot without getting even a smidgen of mud on your shoes if you picked your steps carefully. We started from Dukes Meadows on the Middlesex shore, crossed Barnes Bridge and walked along the Surrey shore to cross the river again on Hammersmith Bridge. Walking past the Blue Anchor Pub we spied an empty table on the terrace outside, which we immediately seized upon. It was a little early for lunch, but we reckoned that a bird in the hand was worth more than a long wait further up the river. Being outside seemed like the only option on such a glorious day, and with our children and Maxi, the dog, in tow it felt more comfortable than being inside. Sadly the highish wall along the walkway obscured our views of the river, but as we had plenty to chat about we hardly noticed. Perhaps if we'd gone inside and grabbed a table on the first floor beside an open window we'd have fared better in terms of being able to watch the river go by. 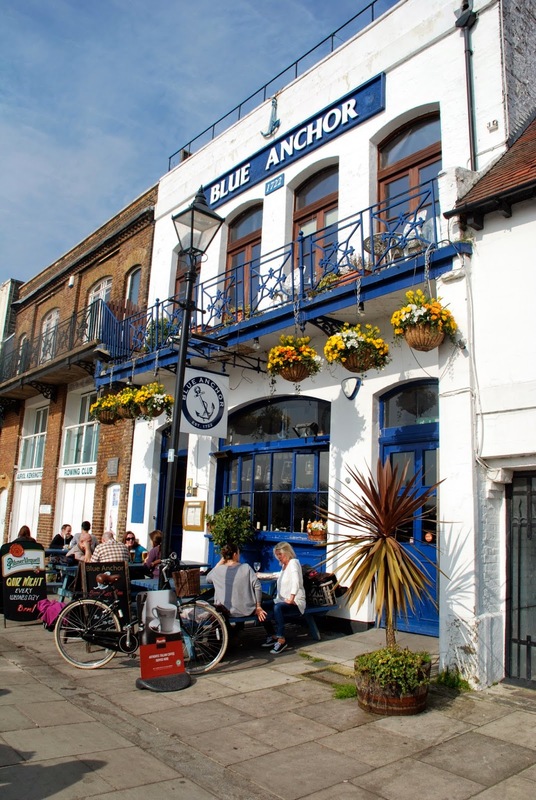 The Blue Anchor is a lovely old pub in the very best English tradition. It was first licensed on 9th June, 1722 back in the time of George I, although it had probably been trading for quite a while before they got round to sorting out their paperwork. In fact it may even have had an earlier licence, but, given that the licenses before that time were granted in the publican's name rather than in the name of the premises from which they were trading, it makes it difficult to know exactly what was going on. We had their Sunday roasts, which came with all the trimmings and were HUGE. The children had chicken burgers from the children's menu, which were also on the generous size. Service was speedy and friendly. The food was delicious, and it was a total joy to be outside dining al fresco. Sadly we weren't able to linger over desserts and coffees as we all had other things to do in the afternoon, but I'd definitely recommend this place for a casual, relaxed Sunday lunch by the river. They seemed to have a good choice of wines, although we were teetotal on account of driving and our later afternoon activities. We drove past this on Saturday - wish I'd read this before that we'd have definitely stopped!